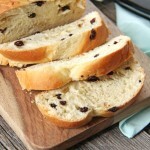 This Easter Panettone Bread is not a traditional Panettone, but a tweaked version of it and it’s a delicious one! This recipe is so easy because you make the dough in your bread machine. Add all of the ingredients EXCEPT for the lemon zest and currants, to the bread machine, in the order listed above. If you are baking the bread in the bread machine, select Sweet Cycle. When the dough cycle is up, remove the dough, and knead in the lemon zest and currants. Then let the dough sit on a floured surface for 15 minutes, covered with a bowl. After this time, split the dough into 3 pieces, and roll it out into long ropes, about 1 inch thick. On a parchment lined baking sheet, braid the ropes, pinching the ends together. Let it rise, in a warm place covered with a tea towel, for 30-45 minutes, or until doubled in size. In the meantime preheat your oven to 350. When the dough has doubled in size brush the surface of the bread lightly with milk or cream. Bake for 25 to 30 minutes – until the bread sounds hollow when you tap the bottom.